Floods are the second-most widespread natural disaster after wildfires. Their damage is so extensive that they are responsible for 90% of all U.S. natural disasters declared by the president. In 2017, floods killed 116 people. That's more than any other weather-related hazard. It's also greater than the 30-year annual average of 85 people. In March 2019, almost 9 million people in 14 Midwest states were hit with record floods. Three people died and thousands had to evacuate. Damage estimates were $1 billion. The states' systems of levees could not withstand the flood levels. In 2017, the American Society of Civil Engineers gave the Aermican levee system a D grade. It would cost $80 billion to repair them. The Nebraska Department of Agriculture said the flood could cost the state’s livestock sector $400 million. The floods and record-low temperatures hit during calving season. On March 21, 2019, the National Oceanic and Atmospheric Administration warned that 25 states possibly face major flooding through May 2019. The heaviest flooding will occur along the Mississippi basin in North Dakota, Minnesota, Nebraska, Iowa, and Missouri. Some areas have already been hit with snow and rain almost 200% above average for this time of year. 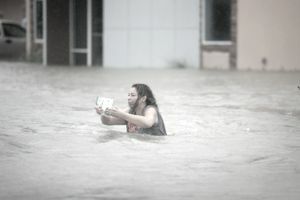 In July 2018, the National Weather Service warned of "dangerous, life-threatening floods" from Pennsylvania to North Carolina, affecting 10 million people. For example, July 21, 2018, was one of the wettest July days ever recorded in Washington, D.C. and Baltimore, Md. Area storms also delayed 3,100 flights, or 25% of the total in New York, NY, and Philadelphia, Penn. Global warming is causing more floods. As temperatures rise, the air holds more moisture. Rainfall becomes less frequent, creating droughts. At some point, the skies release their moisture in a torrential downpour. That creates floods. Instead of soaking into the ground, the water runs on hard-packed earth that has dried out during the drought. Climate change also causes floods by shifting the pattern of the jet stream. The Arctic is warming faster than the temperate zones. That changes the air pressure and turns the jet stream. When it plunges south, it picks up tropical moisture from the Gulf of Mexico and dumps it on the East Coast. Higher temperatures also mean less snow and more rain. One-sixth of the world's population relies on snowmelt for their water supply. They expect slowly-melting snow to supply water at a steady pace. Instead, they will receive buckets they aren't prepared to store. Along the shoreline, rising sea levels are making floods worse. In Miami, Florida, the ocean floods the streets during high tide. To cope, the City of Miami Beach launched a five-year, $500 million public works program. Harvard researchers found that home prices in lower-lying areas are rising more slowly than the rest of Florida. A study using Zillow found that properties at risk of rising sea levels sell at a 7% discount to comparable properties. They include Key Biscayne, Sunny Islands, and Golden Beach as well as Miami Beach. By 2030, Miami Beach homes could pay $17 million in higher property taxes due to flooding. At the same time, nearby properties that are at higher elevations are experiencing rising prices. Extreme weather will increase flooding. Over the next 25 years, river floods will threaten tens of millions of residents. A 2018 study found that over half the United States will need to double existing flood protections. The 2011 Mississippi River flood was the worst in history. Army Corps spokesman Bob Anderson said, "There's never been a flood of this magnitude on the upper Mississippi." Heavy snowmelts, three large rainstorms, and April's tornadoes triggered flooding from the Ohio River, as well. Fear of flooding oil refineries spiked gas prices to $3.98 a gallon. That fear subsided with the opening of the spillways, and gas prices dropped back to $3.96 a gallon. The Army Corps of Engineers estimated it would cost $2 billion to repair the damage caused by the flood. The Mississippi River runs past farmlands and cities in six states. Damage from the flood made these communities more vulnerable to future floods. The Corps received $802 million from Congress to identify and repair the weakest areas. The 1993 Mississippi flood was the costliest U.S. flood of the 20th century. It created $20 billion in economic losses. The National Oceanic and Atmospheric Administration reported that more than 20 million acres in nine states were flooded. Approximately 54,000 people were evacuated, while 50,000 homes were destroyed or damaged. The flood swamped 75 towns, some of which were never rebuilt. The 1927 Mississippi River flood was the most disastrous in U.S. history. More than 600,000 people were displaced, while 500 died from floods that covered 1 million acres with 30 feet of water. Almost 300,000 African Americans were forced to live in refugee camps for months. This triggered a mass migration of African Americans to northern cities. As a result of the flood, the U.S. government created a comprehensive levee system to manage the Mississippi. AT&T has created a model to pinpoint where it expects extreme flooding to occur in the Southeast. The area is vulnerable to coastal flooding from sea level rise, hurricane storm surges, and inland flooding. The most vulnerable states are North Carolina, South Carlina, Georgia, and Florida. The telecom will use the map to adapt, such as elevating cell sites. Between 2016 and 2018, AT&T has spent $847 million on disaster recovery. The projections are for the next 30 years. Between 1980 and 2013, the United States suffered more than $260 billion in flood-related damages. Climate change will increase flooding risks, according to the Federal Emergency Management Agency. There are 2,500 chemical sites located in America's flood zones. Of those, 1,400 are in areas at high risk for flooding. These don't count Superfund sites. Floods are very damaging to homes. For example, a 2,000-square-foot home with 12 inches of water damage could cost more than $50,000 according to Floodsmart. Homeowners' insurance doesn't cover floods. Homeowners in high-risk flood areas are required to purchase flood insurance. The National Flood Insurance Program was created in 2004. By 2018, it had accumulated $39.4 billion in debt. That's the amount of cost that's greater than premium income. The added cost increased the national deficit and debt. As a result, much of the cost of flooding is passed on to taxpayers. Many homes in recent floods did not have flood insurance because they were outside the 100-year floodplain. For example, 75% of the 204,000 homes damaged in Hurricane Harvey was outside the floodplain. The 100-year floodplain identifies land that would be underwater in a 100-year storm. Those storms should only have a 1% chance of occurring in any given year. Floods also cause food prices to spike, depending on how fast the flood waters recede. Soybeans, corn, rice, and cotton are planted in the Mississippi River area in the spring when flooding occurs. Flood waters also strip the ground of needed nutrients. That increases costs to farmers but provides a benefit to fertilizer companies. The federal government offers grants and discounts to help homeowners elevate their houses. It recommends they move their house to higher ground or put their house on flood-resistant higher foundations. Homeowners must also install flood opening. In 2015, President Obama signed an executive order requiring planners of federally funded buildings, roads, and other infrastructure to account for the impact of possible flooding from rising sea levels or more extreme precipitation. President Trump rescinded those rules last year. Perhaps people can learn from fire ants, who survive floods unscathed. Scientists are studying their ability to form waterproof rafts. Mitigation strategies that help people cope with floods will only go so far. By 2100, more than half of the communities along the Eastern Seaboard and Gulf Coast will be “chronically inundated.” They will see 10% of their area flooded at least twice a month according to the Union of Concerned Scientists. To prevent that, global warming must be reversed. Eliminating coal as a fuel for electric generation by 2050. Using solar and wind power for 60-80% of generation. Capturing the carbon dioxide emitted by biofuel plants and storing it underground. To reverse rising temperatures, humanity must also remove 30 years’ worth of carbon dioxide from the atmosphere by 2100. That would require geoengineering on a grand scale. Carbon sequestration captures and stores existing carbon dioxide from the atmosphere. The best way to do that is to plant massive quantities of trees. Worldwide, forests currently store as much as 2 billion tons of carbon each year. But it only partially offsets the 10 billion tons that people emit.